Anyone who lives in or has spent time in Kommetjie will agree that this school is in one of the most beautiful settings in South Africa. It has the Slangkop hillside as a backdrop and the spectacular view across the ocean to Hout Bay and Chapmans Peak. In springtime the area is carpeted with the bright colours of the spring flowers. Kommetjie truly is a beautiful place to learn, grow and work. It is a privilege for us all to celebrate Kommetjie Primarys Centenary Year! One hundred years after the Slangkop PublicSchool opened its doors on the 10 March 1908 to eleven pupils under the care of Alice Seabrook, the school is now known as Kommetjie Primary, and has around 200 pupils under the care of Mr Bevil Velensky. A brief history of the road from then till now is described below. In those old Cape Colony days it was a farm school, which was accommodated somewhere on the premises of the old Imhoff’s Gift Farm. By 1909, there were 15 pupils. During the first five years there were five different teachers, Edith Atkins, Miss Prince, Miss Galloway and then Millie van der Poll. These teachers were living and working far from their homes in a very isolated part of the Peninsula. In 1913 Miss Kleyn became principal and a year later, the lighthouse was built and the First World War began. The war also brought increased activity to the Wireless Station and soon romance was in the air as Japie Boltman caught the attentions of Miss Kleyn. In 1919 she married Japie.and left the school. Many children apart from those of the Wireless Station Staff, had a long way to walk to and from school, and apparently no classes were held on very wet days. In 1922 a building was completed across the road from Imhoff’s Gift, when Miss O’Kennedy took charge. Later on Leone de Brehem became principal and in 1933, the school staff doubled to two, with the appointment of an assistant. In 1938, the first male principal, William van der Poll, was appointed. By this time, the enrolments and staff at Imhoff’s Gift School had grown steadily. It was in 1960, when Mr Willem Thiart was principal that the pupils were transferred from Imhoff’s Gift School or Old Slangkop School to our present day premises in Kommetjie itself. In 1964 Mr Thiart retired and was succeeded by Mr Hannes van Deventer until June 1982. Isola Brocker, was school secretary from 1968 to 1979 and recalls that when she started, there were 28 children at the school, the principal and 3 teachers and that as the community grew so did the school. There were no school fees and Isola recalls that the ladies were as enthusiastic about fund raising then as they are now. She remembers the first fund-raising bazaar they ran which raised exactly R444.41 and with this they built a mini-tennis court. They also held regular dances, for the community at the hotel (which is now Stepping Stones). The R2 entrance fee covered snacks, curry and rice, and still left some thing for the school kitty. There were Saturday afternoon movies for the children which cost them R1 including sweets! School uniforms were introduced in the 1970’s. 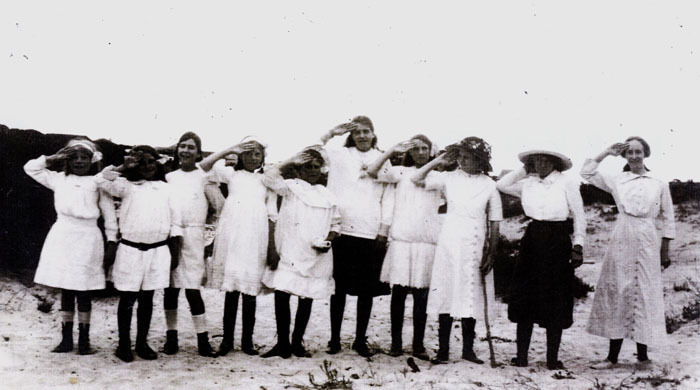 The first batches of uniforms were surplus from Fish Hoek Primary and the dresses cost R4. The first sports day was held in 1970 down at the grassy bank of the Kom, after which Mr Brocker (Isola’s husband) set up a proper athletics track. Over the years he worked tirelessly for the school and was responsible for planting a lot of the grass and trees. In July 1982, Benjamin Petrus Coetzee was appointed as principal. There were now only 32 pupils and 3 staff members at the school. It was during this time that a lot of improvements were made to the school. By September 1996 when Mr Coetzee retired form teaching, there were 208 pupils, 9 teachers, a secretary and 3 general workers. Mr Adriaan de Waal, was appointed principal in January 1997, when the school was further developed by the addition of the school community hall, new classrooms and various other additions. In January 2008, the beginning of the schools 100th year, Mr Bevil Velensky was appointed the new principal. The school still has approximately 200 learners and has retained its character of a small family orientated community school. Mr Velensky’s vision for the school includes academic excellence and leadership, while maintaining its community character.